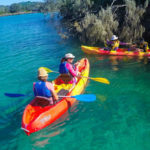 Byron Bay Kayaking Tour with Dolphins: This Bryon Bay Kayaking Tour is a 3 hour kayaking experience with the opportunity of paddling with dolphins in Cape Byron's Marine National Park while learning the local Aboriginal stories and sacred places. 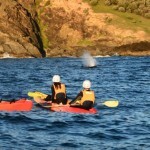 Depending on the time of the year you may also get to see whales and turtles as they swim by the marine reserve. Of course there is also amazing views of Byron's coast line and the Byron Bay lighthouse from the water. That you'll see all year round. Your 3 hour Byron Bay Kayaking Tour will start at Byron Bay beach where you meet all your fellow paddlers. 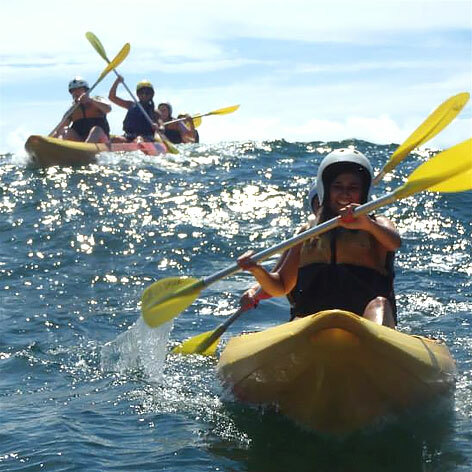 You'll pair up on the 2 person kayaks while your professional kayaking guide will teach you the basics of paddling a your sit-on-top kayak. Then its time to hit the ocean! You'll impress your friends (and yourself, just quietly) getting out past the shore break. 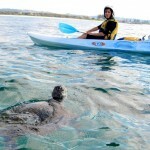 As you paddle out, your guide will talk about local Aboriginal stories and point out sacred places. You'll paddle past The Pass surfing Mecca, Wategos millionaire row and Cape Byron, Australia's most Easterly point. 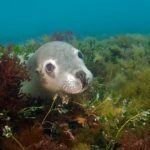 Remember to keep an eye out for those cheeky dolphins, whales (when in season) and turtles popping up for a breath of fresh air. We'll take a short break, refuel with yummy refreshments and a swim. Then we'll finish with a paddle back to the main beach while enjoying the stunning view of the Byron Bay coast line and lighthouse. You might like to surf a wave back to shore, we will show you how. 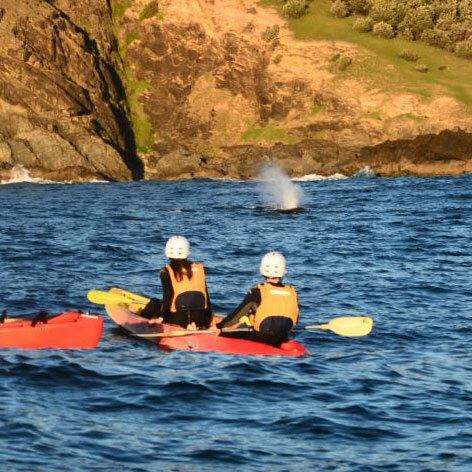 Tours operate in the Cape Byron Marine Park, we launch into the ocean at Clarkes Beach. No experience is necessary, our expert guides teach you all you need to know to enjoy your tour. Meet at our trailer on the park – opposite 56 Lawson St. Byron Bay 20 mins before your tour time. 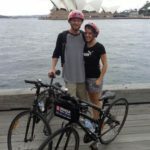 We can also pick you up from your accommodation in Byron Bay at no extra charge. 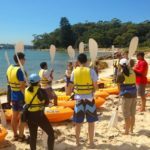 Sit-on-top-style kayak, safety equipment, snorkelling gear and morning tea. Pick up from your accommodation at no additional charge. Your swimmers and some sun cream, especially on legs and feet. a towel for when you get back to shore. A baseball style hat and sunnies are good. YES - this is part of the fun and experience! 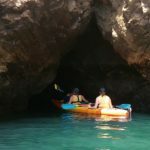 We will provide you with everything you need to enjoy your tour - including safety equipment, snorkelling gear and even a full length wet suit in the cooler seasons. Only waterproof cameras are suitable. All your belongings can be securely locked in our trailer. You do not need to be an experienced paddler – we will show you the basics to get you started. 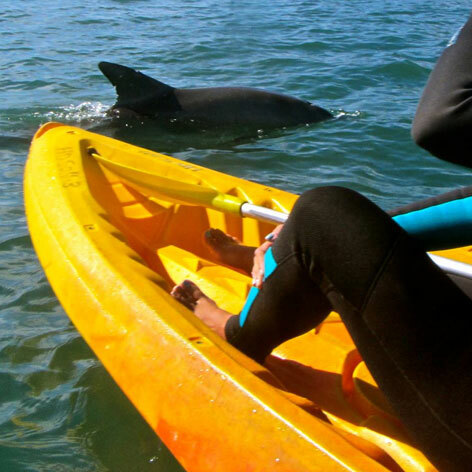 Most of our customers have never paddled before and they love it! Our tours are run by local Surf Life Savers, ensuring your safety. We have a 100% Safety Record. You are still welcome to paddle, pease notify your guide if you are a non-swimmer before starting your tour. All paddlers are fitted with a lifejacket. What sort of kayaks do you use? On the Byron Bay Kayaking Tour we use double kayaks. We find with two people working together we can go further and see more.